Diminishing design limitations by developing a flexible battery in many sizes without handing over battery-life capacity. Is this the long awaited leap forward for Battery tech? From a fashion tech point of view, it seems like things are not getting ‘better by the year’ for the Consumer Technology Show (CES) in Las Vegas. As we enter 2017, looking for fashionable technology can still be like looking for a needle in a haystack. The FashionWare show, which runs alongside CES, hasn’t given us a reason to allocate column inches to its efforts. On top of that, real fashionable consumer products can still be counted on one hand. The main reason in my opinion is that designers and engineers are still coping with huge design limitations. 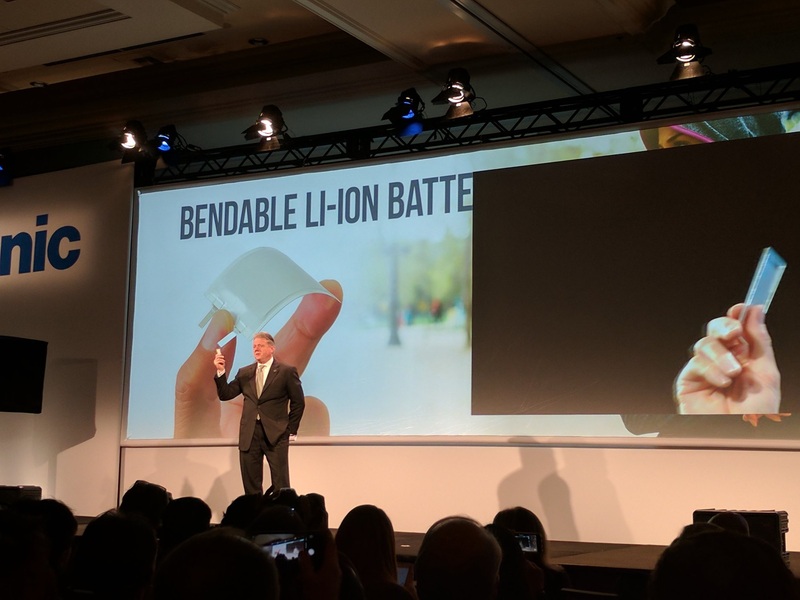 That is why we were happy to have stumbled upon the endeavors of Panasonic, who unveiled their flexible battery at this year’s CES. It is very easy to focus on the negative offerings of today’s wearables. Of course, there are many valid reasons why many wearables end up in the kitchen drawer within six months. Besides the security issue, the lack of battery life might be the greatest discomfort when it comes to the overall user experience. On top of that, batteries are the decisive factor when designers are trying to make something beautiful. So in order to make a difference, they need capable batteries minus the clunky appearance. 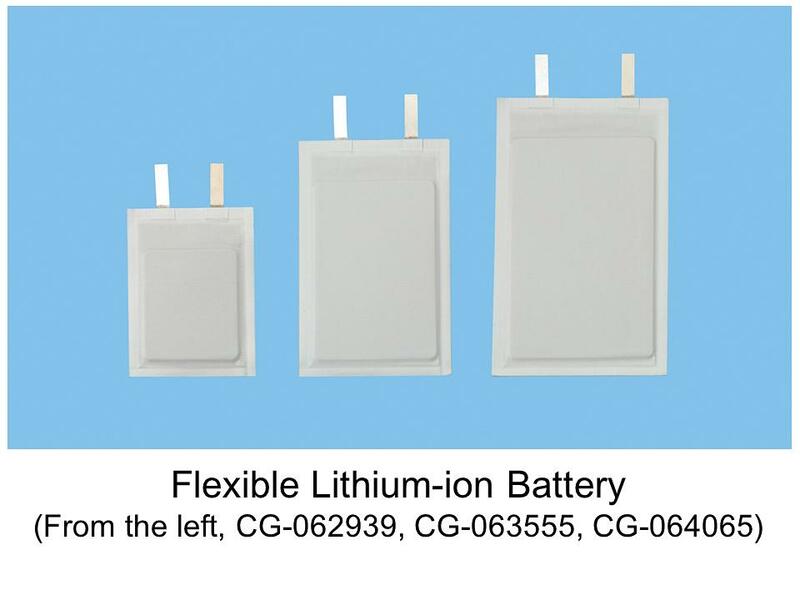 The good news is that Panasonic has come up with a bendable, twistable and flexible prototype Lithium-ion battery. The battery is available in three sizes. The smallest is 28.5mm by 39mm, the medium size is 35mm by 55mm, and the largest is 40mm by 65mm. When it comes to thickness, our credit cards are an average of 0.76mm thick, the Panasonic battery has a thickness of 0.55mm/0.022 inches. This feature does not handicap the battery. It is still basically able to maintain all of its capacity when twisted over a 1000 times. This suggests great durability, a great advantage should the battery be somehow worn on the human body. According to Panasonic, product development will continue towards mass production, with an eye to an even slimmer form factor, ideal for various IoT devices such as card devices and of course, wearables. The use of laminated outer body and internal structure makes it difficult to cause leakage and abnormal heating during repeated bending and twisting. That’s why the battery is reliable and safe for use in wearable tech when it is attached to the body. It is clear that the battery tech space needs some serious designing. Currently, many new technologies are able to show enhancements that are in line with the Moore’s law processing power speed. Which predicts a doubling every two years. Which means that if we were to apply Moore’s Law, batteries, as it stands, been lacking innovation for decades. From that perspective, Panasonic’s battery endeavors, which started way back in 2008, now contributes to longer life of devices retaining charging and discharging characteristics.